China is poised to gain global importance as a growth engine for the world economy on a par with Europe and the USA. Japanese multinational enterprises are increasingly active in relocating to China their R&D and capital- and knowledge-intensive production for both export-platform and target market reasons. It is at the juncture of the growing impact of China-related activities of Japanese corporations on the transformation of Japanese management philosophies, on the one hand, and the transformation of the Japanese economy more generally, on the other, that this book is situated. As Japanese corporations re-align activities to increasingly accommodate the growing importance of China as a business location, inter-regional expansion will integrate more deeply the Chinese economy within their global strategies, business structures and decision-taking. 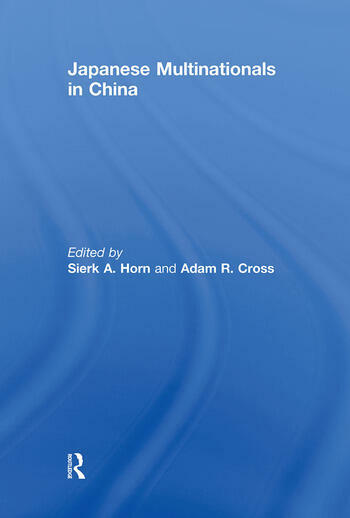 By presenting current research and thinking on the significance of corporate Japan’s growing engagement with China, the book explores the following imminent questions: What is China’s future position in the global corporate activities of Japanese firms? How has China’s investment profile changed and how and with what purpose do Japanese firms enforce their Chinese presence? The book sheds light on the implications for European businesses and policy-makers of the consequences of deepening integration of these two economic powerhouses. This book was published as a special issue of Asia Pacific Business Review. Sierk A. Horn is Senior Lecturer in Japanese Studies at the University of Leeds. Adam R. Cross is Senior Lecturer in International Business and Director of the Centre for Chinese Business and Development at the University of Leeds.